Mr Robert Sarfo Mensah, the Director-General of the National Sports Authority (NSA), has urged corporate bodies to adopt some sporting disciplines in the country to help in their development and promotion. 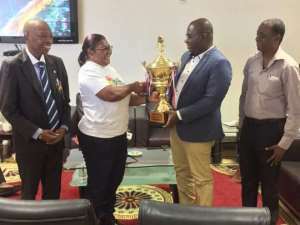 Mr Sarfo Mensah made this known when the Ghana Revenue Authority (GRA) female hockey team, called on him to present the trophy won at the just ended African Cup of Clubs Championship (ACCC), held in Accra at the Theodosia Okoh hockey pitch. In an interview with GNA Sports, the NSA Director noted that GRA was doing something worth emulating for the other corporate bodies to help in the development of sports in the country. According to him, there are over 45 sporting disciplines in the country with most of them in dire need of support and sponsorship. 'The GRA has been consistently supporting and funding hockey and it's a good thing for developing that sport. 'I would love to see other corporate bodies like Tema Oil Refinery (TOR), Ghana Oil (GOIL), Ghana National Petroleum Company (GNPC) and the rest of the entities adopt some of the lesser funded disciplines and make it their own, which would go a long way to help the country. According to Mr Sarfo Mensah, his outfit would be meeting the corporate entities to find ways to help develop and adopt the various sporting disciplines. The former Member of Parliament for Asunafo North congratulated GRA for all they have done for Hockey in the country but urged them to also look to other areas where they could help as well.